Backlinks are an incredibly important part of SEO, and they can be tricky to get just right. Even if you’re focusing on quality links from one source, you’ll likely encounter the issue of an unbalanced link profile. Too many links from one source look unnatural and can be just as dangerous to your SEO. You need to diversify, that is what we are offering in this service for a budget price. 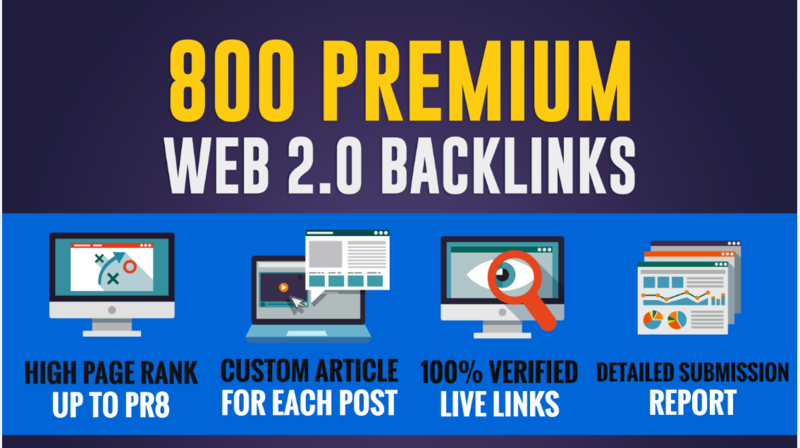 800 HQ PR Panda safe Contextual & Unique Web 2.0 backlinks. Detailed Submission Report.We will create accounts for your submission and will provide you with the accounts credentials (usernames & passwords). For each 3 units that you buy I will do one for free. Boost Your Rank With 800 Web 2.0 Contextual Backlinks is ranked 5 out of 5. Based on 4 user reviews.